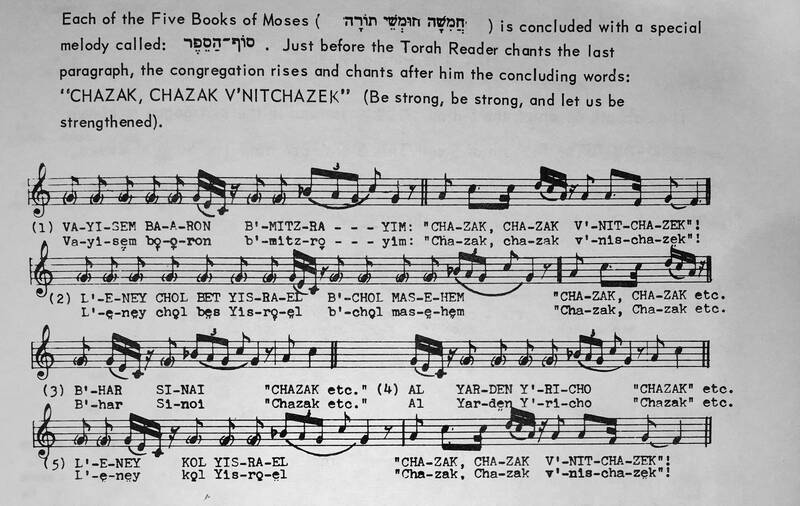 I'm pretty sure that the end of the Torah is sung the same as the end of any of the other four Books of the Torah, with an embellished style that leads into the congregation blessing "Chazak Chazak Venitchazek". For one example of how this sounds, listen to the end of this recording of the last section of the Torah by R' Jeremy Wieder. Binder suggests using the Chazak Chazak melody (aka the Song of the Sea melody). i'm pretty sure Jacobson has the unique melody some people do, but that book is 1000 pages long and I don't have it with me right now. Somebody else who has it could definitely find the page and scan it for you. Not the answer you're looking for? Browse other questions tagged trop-cantillation . What's special about where the unique karne farah trope appears? What is the origin of using a different trope mode for the High Holidays in Nusach Ashkenaz? Which groups of people read the 10 Commandments using the “lower” trope? Is there an online source for trope occurrences?